The Waltham Manufacturing Company of Massachusetts began in 1893 as makers of cycles to which it gave the name Orient. 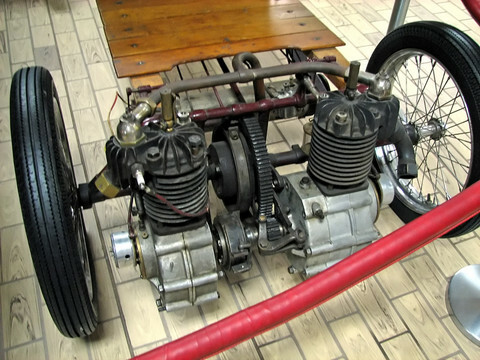 After experimenting with an electric car in 1899 Waltham acquired an agency for De Dion-Bouton tricycles and quadricycles, the firm's engines and also those of Aster. In 1903 it launched the 'Orient Buckboard' as "The Cheapest Automobile in the World". This had a lightweight wooden platform to which the axles, a rear-mounted air-cooled engine plus transmission, and a bench seat were attached; the flexibility of the timber provided the suspension medium and the ensemble was tiller-steered. All that the driver and passenger had ahead of them was the open road. The vehicle sold quite well, became marginally more sophisticated and was still available in 1907 by which time the firm was using the Waltham or Waltham-Orient name for its products, some of which were four-cylinder touring cars.